Submandibular gland. Image copyright: Mathias Nordvi, ARR. 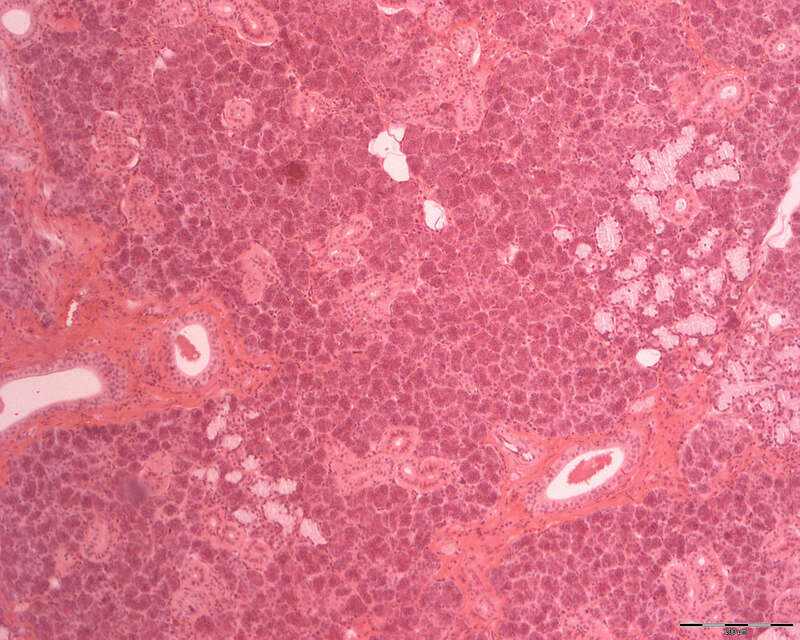 (Tissue stain: H+E). The submandibular gland is classified morphologically as a tubuloacinar gland. It is a mixed gland composed predominantly of serous acini. These acini stain darker than the mucous acini and is what makes up the bulk of the gland, as you can see in the image. The small proportion of mucous acini can be seen as lighter spots among all the serous acini. This is what distinguishes the submandibular gland from the parotid gland because the parotid gland is a purely serous gland and contains no mucous acini. Published May 26th 2014, updated December 21st 2018.